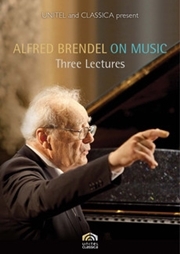 This DVD makes available again the memorable TV recording made in 1988 at the Middle Temple, London, in which Brendel performed the composer’s final three piano sonatas. These sublime works are repertoire in which Brendel has few peers, and the DVD booklet contains an extensive essay on these pieces by Brendel himself. Further the to the original VHS and Laser Disc release, this new DVD features both CD-quality stereo and a DTS 5.1 surround sound. 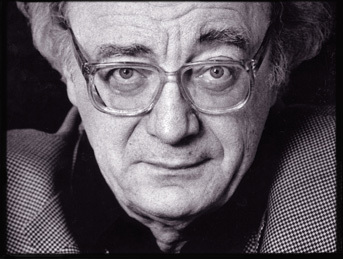 A perfectionist at the piano...master pianist Alfred Brendel. 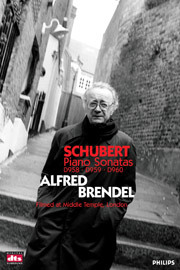 Alfred Brendel, a master Schubertian, is the most probing and lyrical of pianists. 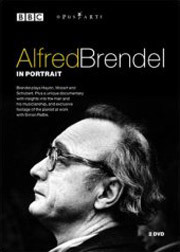 Alfred Brendel is an artist whose main work - interpreting music written for piano - is powerfully illuminated by reference to many other aspects of his life, including his love of paInting, literature, theatre and nonsense. Filmed over a period of two years, this TV documentary explores the musical and non-musical influences that have shaped Brendel's life. It highlights the creative process as he collaborates with many fellow artists. Highlights of the programme include a rehearsal of Schubert's Winterreise, with the renowned Matthias Goerne in Cologne; a reading of his own witty, and often obliquely self-revelatory, poems; and the rehearsal in Vienna of The Beethoven Piano Concertos Nos 2 & 3 with Sir Simon Rattle and the world-famous Vienna Philharmonic Orchestra. A Rosetta Pictures production for the BBC and ZDF in association with ARTE. 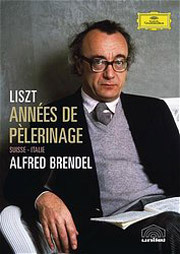 Alfred Brendel, one of the greatest pianists of the 20th century, has, over the years, written highly original musical essays. Now retired from public performance, he is presenting some of his most acclaimed written work in the form of lectures. In three sessions specially presented for the camera Brendel takes his listeners on a journey of discovery behind the notes and into the mysteries of the musical world. Brendel fascinates each and every listener with his crystal-clear mind, vast musical knowledge, dry wit, and verbal elegance.